I am fascinated with trees. There’s new and maybe not so new research showing us their complexity and their extensive ecosystems that exist beyond our ordinary senses. 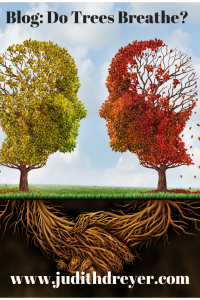 We know they communicate through their root systems to each other. They send nutrients to a family member in need. They will also share water. Roots are connected by a mycorrhizal hypha network of fungi creating a kind of highway and inner net within the soil beneath the forest floor. Debris and leaves, insects and critters, microscopic nutrients and various species exist within the canopy of a forest and its layers. Mother trees help and support their young ones. And did you know they can cry when in need? My guest this week, Lois Grasso, author, and transformational breath practitioner spoke about using the power of our breath as a healing modality. We can get stuck emotionally and hold our breath, maybe not dramatically but enough to block our connection to the best part of self. 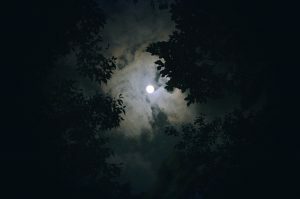 Since this blog and podcast series: Holistic Nature of Us is concerned with all the parts functioning optimally here within us as a human being and within all aspects of this planet, I wondered about trees. Air is an element that governs this planet. There would be no breathable air without our plant kingdoms. She got me thinking about trees, our relationship with them and how they are suffering today. I read a report through my Master Gardener office last week that trees here in CT are suffering. In certain areas, they got hit two years in a row with gypsy moth infestations. The first year of the moths we were in our second year of a drought. Both factors weaken a tree, both factors open the door to their demise. When growing by roadways, they pose a hazard if and when they should topple over. The cost to remove them is also a factor that towns and the state have to consider for budget concerns. But let’s get back to breath and breathing. Our first breath gives us life. Without our breath, we cease to exist. Our first responders know only too well that evaluating our breathing is critical to triage work. Life and death are only one breath away. How does a tree breathe? The leaves on trees and needles on our conifers have narrow slits on their undersides, openings that allow them to exhale and inhale. Roots can do the same thing too. We inhale O2 and exhale CO2 due to complex cellular processes. Trees use CO2 to make food and release O2 in this process which is photosynthesis. ignite the metabolic processes within plants, photosynthesis ceases and trees breathe in O2. too. So they exhale O2 during the day but need O2 at night. We take breathing for granted. Breathing can be soft or filled with emotion. There’s nothing like the soft gentle breath of a newborn babe. You could say breath is connected to touch. Trees breathe and we can feel the breath of a forest that maybe quite literally takes our breath away. I hope you will breathe with more mindfulness today and awareness that trees breathe too. During the day we have a breathing relationship with them: we breathe in O2 and exhale CO2 while trees breathe in our CO2 and give us O2. We are connected in very profound ways. Remember all comments are appreciated. Please like and share. Thanks. Description: What’s happening to our birds and bees? Essential to the health of our ecosystems, many suffer the loss of habitat, food, and shelter. Jane is the steward for The Belding Wildlife Management Area here in CT. Beautiful meadows attract a variety of insects and other wildlife. 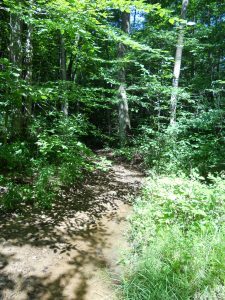 Managed nearby forested areas keep the ecosystem strong and healthy. But, let’s get back to the birds and the bees. What do they need and how can we help? Jane’s expertise and tips are practical and timely. About My Guest: Jane Seymour is a Wildlife Biologist and steward of the Belding Wildlife Management Area in Vernon. The Belding WMA was donated to the State of CT by Maxwell Belding who then set up a trust fund to help manage the habitats and provide environmental education. Received a Bachelor’s degree in Wildlife Conservation from the University of Massachusetts, and a Master’s degree in Natural Resources from the University of Connecticut while researching habitat use of American kestrels. 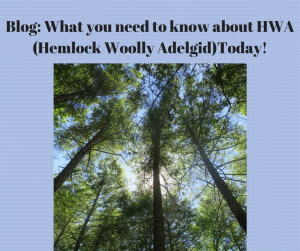 Blog: What you need to know about Hemlock Woolly Adelgid (HWA) TODAY! Every species has a role in our natural ecosystems. 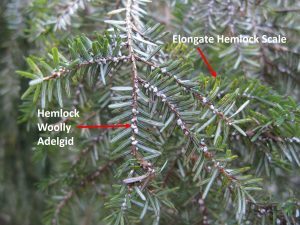 This week’s guest, Carole Cheah, research entomologist with the University of CT Agricultural Extension Service shares her research findings concerning Eastern Hemlock and its pests that contribute to its demise in our eastern forests. Eastern Hemlock: Tsuga canadensis is known as “the redwood of the east”. Tall and majestic, it lives quite long. Do not mistake its size for age. Many young appearing saplings can be quite old as they wait for the forest canopy to open and become flooded with sunlight. Then they shoot up, reaching for sunlight as fast as they can. Its ladder like branches provides habitat for many species. As an evergreen, the needled branches provide shelter in winter and keep the forest cool in summer. They like water and are often found by streams and waterways. Many species depend on them. Not just the tree itself but the ecosystem habitat they sustain in our forests. However, our Hemlocks are beset with two troublesome pests. Today I am sharing a photograph of what the HWA or hemlock woolly adelgid egg mass and elongate hemlock scale look like on hemlock needles. A picture, they say is worth a thousand words. I hope you agree. The bug surrounds itself with its egg mass and it looks like leftover snow on the branches. Or maybe like cotton tufts which make it very easy to spot on branches especially by the tips of branches as they munch on new growth. What I also learned from Carole is how the weather affects some of our pests. In this instance, a deep New England freeze can actually harm the pest and decrease its numbers. If you want more information, where to purchase the beneficial pest that helps eliminate HWA, contact your State University Agricultural Station or your Master Gardener program also run by the University Ag station. Hopefully, you are inspired to keep a closer eye on your hemlocks. I know I am. Check them in late winter, early spring. Lower branches can be removed or rub the egg mass off. Check with your county agricultural station. They may have folks like Carole monitoring the health and status of hemlocks in your geographic area, offer pest control advice and more. Old and sentient, these trees have been around a long time, provide invaluable habitat, diversity, and integrity to our forests. Our forests are holistic. Droughts or intense rains place stresses on our natural plant populations. Intense research efforts are being made to preserve our precious native species such as the eastern hemlock. I appreciate your comments. Please share. Thanks.